Whenever you receive an email about a ‘change of service,’ smiling is usually not your first reaction. That said, your friends from Flickr seem intent on giving you a tickle. The hard part is deciding how your left brain should respond. I got an email from Flickr last week. Yahoo’s Flickr has just significantly upgraded its free account plan. Before, they gave you a paltry storage limit of only 200 photos. That’ll last you about fourteen minutes. Now, the limit is a whopping 1 terabyte. Yahoo says that will get you over 500,000 photos. I was a little dazed. Didn’t know whether to smile or not. Wasting $25 for Flicker Pro? The old 200 photo limit clearly wasn’t enough. So I’ve been shelling out $25/year for a Flickr Pro account, which gave me unlimited storage. But now… there’s the cool new ‘Free’ plan that makes the old Pro plan seems like an expensive downgrade. A sudden dinosaur doomed for extinction. Unlimited is nice, but a terabyte is plenty of storage for all the photos you’d ever want to share. Believe me, nobody wants to look at half a million of your photos online! Before they gave you an upload limit of 300MB/month. Before, the maximum size per photo was 30 MB. Before, you didn’t have full-resolution photo access. They’ve also expanded their video uploading and storage limits. You’ll be upgraded to the same photo and video size limits as the new free accounts. If you don’t think you need your Pro account anymore, Flickr is happy to switch you to a free account before August 20 and give you a prorated rebate. So what do you really get for your $25 to stick with Pro? For me, it comes down to the unlimited storage and the ban on ads. And again, who really needs unlimited storage for sharing photos? Selling Your Soul for $25? Look, I get that Yahoo needs to make a buck, and putting ads on your photo galleries is one way to do that. I’m not angry with Yahoo for wanting to commercialize my photo pages. I’m just not that happy about it. See, you should have gone Pro when you had the chance. It stinks to have to pay twice as much, but it’s still worth it. Flickr also offers a new ‘Doublr’ account ,which gives you twice the storage of the new free account. Yes, it’s not a typo. Not sure I understand the math here. I’m paying $25 for unlimited storage, and some new guy is supposed to pay $500 for 2 terabytes, while his friend is getting 1 terabyte for free? Hey, how about 2 free Flickr accounts?! I can’t tell you how happy I am that Yahoo feels the need to explain this. helps me feel like I’m not shooting too low in my knowledge-transfer goals on my blog. That said, I feel compelled to share with you this additional data, which I learned from a cool Cisco report. Maybe one day, Yahoo will offer up a zettabyte of storage for free with their new Virtual Reality Flickr accounts… perfect for your newly installed holodeck! Once upon a time, I used to happily pay $99/year for MobileMe, which included Apple’s wonderful photo and video galleries. Now in hindsight, 20 gigs of storage seem downright stingy. 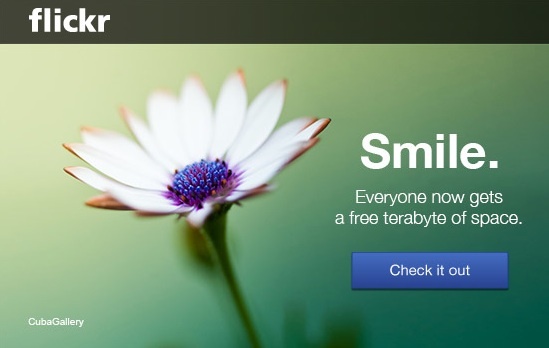 A terabyte of free Flickr storage is just silly good! But there are still the annoying ads. $50/year is easily worth it to scrub those pesky ads off your galleries. And $25 for unlimited storage (ongoing Pro subscribers only) is a downright bargain! Yes, I’ve been designated a dinosaur by Flickr, but I feel they’ve actually handed me the deal of the year! Flickr has pledged to maintain the legacy Pro plan for existing users.